Two weeks ago I announced that I will now be posting on this new blog in order to share with ease to the public on Gaijin's announcements on Japanese Ground Forces. The blog's opening has received great initiatory responses from the War Thunder Live community, and I will continue to use this portal to answer, inform, and communicate to you all in the time to come. Thank you, again for all the support. Understandably, there are those who are uninformed on who I am and what I do. My name is Seon Eun Ae, and on War Thunder I go by the alias of Mai_Waffentrager. I started working with Gaijin Entertainment as far as back as May, when they found my community project and I on the Forum and our website. Details kept private aside, I council Japanese Ground Forces and help provide the necessary information in order for them to arrive here in safe hands by visiting the Japanese National Archive for tank and military relating documents. No, this does not mean I can tell you anything Gaijin hasn't already publicized, sorry folks! A little about my personal self - I'm a UOS student majoring in Political Law and Public Affairs here in Seoul, South Korea (Whilst maintaining semi annual residence in the United States). I'm Korean by blood, despite the often misconception of me being Japanese, I am not. I tend to get confused for being Daigensui, a notable Japanese-Korean figure on the World of Tanks community and the one who got Japanese tanks in Wot. Many conspirators want to claim us one person and accusate each other, but sorry to say we are two different people, albeit friends and colleagues. I have nothing to do with WG's title publicly, and she hasn't the connections with Gaijin like myself. Now that the community project to get Japanese Ground Forces recognized and implemented has finally came to a finish, this does mean my work with you all has ceased. I am both occupied with real life events and work with Gaijin, But recently I was requested to start work again on a community project to give situational awareness to the community of War Thunder. 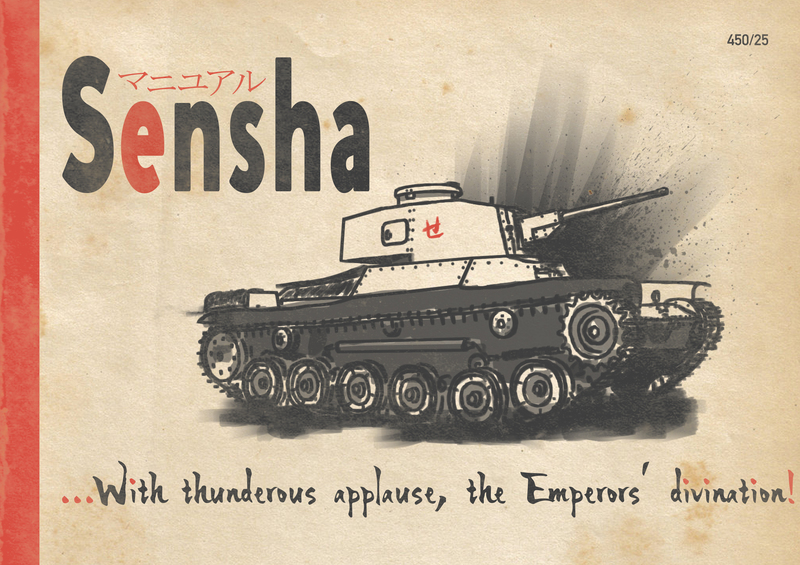 As the Blog title implies, in the very neat future I will publicizing a concurrent series, SENSHA. This project will not be directed towards to Gaijin. Rather this is our project for you, the tankers, to have a better understanding of Japanese ground forces and tanks alike. This is a manual, to which I and a small team will visually illustrate to you the lifestyle of the Japanese tank, how they operate, and how to properly care and utilize them in the field whilst providing historical background. We had decided what better method in appealing to the community than using the iconic Tigerfibel tank manual as a reference in this project. This manual and comic alike is being worked on at this moment and gathering assets in preparation on going fully public. Unfortunately while we have a team of outstanding artists (such as CmdNomad and teo_storm1) to make dedicated illustrations for the manual, we are lacking in character-preference artists to provide the finishing spot. However in short time we will release the first issue of SENSHA and hope you all will enjoy it and support its rapid continuation. We are steadily preparing the project for you all, so stay tuned to upcoming news! So how do you get access the original documents. I stay in contact with the Japanese National Archive, in the Asian Historical Records section. A few times a year I will visit Japan and go there in person to photograph and look through files I find obtaining to my interests. Otherwise I keep to the online records. And after have finished Sensha, do you plan to do something else, or you'll take some "holidays"? I plan Sensha to be a year long project. But after it is all said and done, I have a feeling I will be relocated to Tokyo or the Unites States more often. So player meetups is something I'd like to try more. Kudos to this effort :) What will be the historical scope of your articles? Will you limit the info to just WW-1 to immediate post WW2 vehicles or are you also going to discuss more modern specimens like the Type 90? Whole ten yards and more.